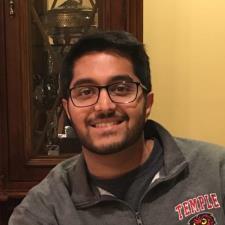 I’m Akash K., a 22-year-old male with a true passion for math, science, and essay writing. I have tutored in the past and have had great success with my students, ranging from elementary to high school-aged students. I began tutoring in high school where I would help kids in middle and high school with science and math. In college I would tutor part time in essay writing and SAT essay writing for high school kids. I prefer one-on-one tutoring and enjoy engaging my students with fun and challenging problems. Just as I prefer to be taught, I am patient and work with students’ strengths so that they can deliver the best results. I also like to make sure my students are able to build techniques and habits that will make them excel long term in school. One of my main strengths in tutoring is writing assistance. From a very young age I was very good at proof reading and writing essays. I received the highest writing scores in SAT writing (12) and have always been talented in writing essays in school and college. I took a technical writing class as well so I am well rounded in my background of essay writing. In college, I also helped at my Writing Center and peer edited essays in my free time. In addition to this, I was a Sociology minor and had to write, read, and edit numerous papers about a variety of topics. Whether it be writing an essay from scratch, developing a way to produce good quality essay every time, or just needing an extra pair of eyes to look over and make an essay better, I am positive that I can help you (or your child) excel. Throughout my life I have had a passion for math. I scored a 780 in the SAT Math section. I always received top marks in math throughout high school and got A's in Calculus 1 and 2 in college. I was a math tutor in high school where I tutored elementary and middle school kids with basic math and Algebra. In my college years, I was a peer tutor who helped other college students with algebra and pre-calculus. With these students, I taught them basic techniques to help them solve problems more efficiently and confidently. I also majored in Biology in college. I have taken Biology 1 and 2, Ecology, Genetics, Microbiology, Environmental Science, and many subjects in the realm of biology. With my extensive biology/science background, I was able to tutor freshman in college in biology and chemistry (the entry level courses). I ended with a 3.7 in college and excelled in all of my biology classes. I also tutored high-school students in biology when i was 17-20 years old. I mostly tutored kids in Biology, AP Biology, Chemistry, and AP Chemistry. These students liked the way I taught because I taught them study techniques and tips which they carried throughout their education. I am a patient and positive tutor who wants to develop you as a holistic student. Beyond improving a certain subject, I want to make sure you have the skills and techniques to have long-term success in school. Please contact me if you have any questions or are interested in elevating your grades. My major in college was Biology so I have an extensive back ground in most biology subjects. Some of these include: General and AP Bio, Microbiology, Ecology, Cell Biology, Anatomy, Biochemistry and Physiology. I have tutored students in General Biology and AP Biology in high school as well as in college.